Cloud technologies have been evolving and improving over the years at a rapid pace. Finding the right tools for your business doesn’t have to be a hassle. Your IT partner can help find the right cloud tools for your business. There are many companies out there that offer cloud services. Finding the right one is just a matter of comparing what each one has to offer. Here at ITC we offer Cloud Solutions for businesses of any size and industry. We know how confusing technology can be. That’s why we focus on your technology so you don’t have to. We’ve previously talked about How Your IT Partner Can Help with Office Moves. As you are planning you’re next big move, you might want to think about what types of virtual moves you can benefit from as well. Cloud technology is great for doing business on the go! Emergencies can happen and sometimes you have to work from home. Wouldn’t it be easier if your data could be accessed from anywhere? Cloud technologies have allowed us to step away from our traditional desks to being able to work anywhere. Traveling for business? Your data is ready for you anytime, anywhere! Never worry about not being able to work on something because the information is saved at your office computer. A lot of modern companies have adopted the idea of having employees in different states. You don’t have to be tied down to an office. Collaborating on projects can be even easier with cloud technologies. In real time different people can be working on the same project through applications or online servers. Google Doc, for example, lets different people add comments and work on the same paper in real time. All you have to do is share it with a coworker through email or allow access through a link. Team collaboration has never been easier with the cloud. The greatest thing about cloud technologies is that they can change to fit your needs. If most of your work is done online then a storage plan with more capabilities might be the best fit for you. With the cloud, you can always scale up. Cloud Technologies aren’t limited to an office space. It’s hard to predict the number of resources you’ll need at the beginning. You can react and adapt to your needs as their arise. This allows your business to be more flexible. Cloud technologies can store your information online. This means that there is now a backup of your data somewhere that is not your own computer. With the proper security in place, your cloud center can also work as your backup center. I know when I have documents that I might need at a moment’s notice, I like to store them online for easy access. This gives me the guarantee that I will always have them, even if I lose the original file on my computer. 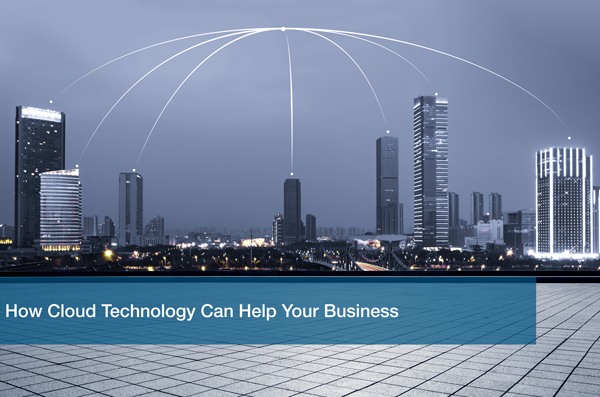 There are many other ways that cloud technologies can benefit your business. The ones listed here are just the tip of the iceberg. Here at ITC we offer Cloud Solutions for businesses of any industry. Call us today to schedule a Free IT Analysis so we can find the right tools for you.